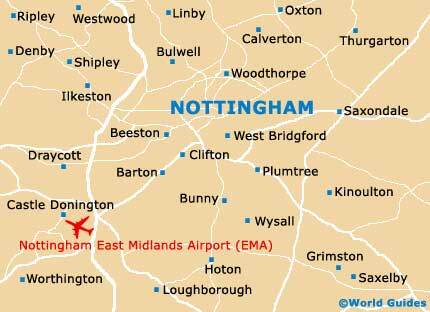 There are plenty of places to stay all over Nottingham, including high-rise modern hotel chains, family run bed and breakfasts, travel inns and motels, and also a number of popular guest houses. 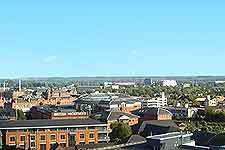 Hotel rates vary per season, being at their most expensive during Nottingham's busy summer months. 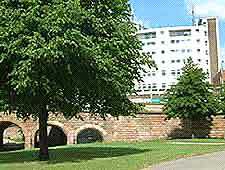 Many hotels in the city enjoy a central location, close to the shopping centres and main sights, such as Nottingham Castle. A number of budget accommodation options are available for those looking to stay here as cheaply as possible, such as the Holme Pierrepont Camping and Caravan Site at the National Watersports Centre, on the south-eastern side of Nottingham. Also a noteworthy alternative to hotels and more mainstream accommodation is the Igloo Tourist Hostel along Mansfield Road, which is close to the Victoria bus station. Many further accommodation options lie nearby, including a selection of inexpensive B&Bs around the Sherwood area and many cheap hotels on Mansfield Road, such as the Best Western Westminster Hotel, the Cotswold Hotel and the Park Inn. Maid Marian Way has long been one of the most popular spots to stay in the city and is easy to reach, being close to a number of main roads. Just a short walk from the city centre, hotels here are close to Brewhouse Yard, Ye Olde Trip to Jerusalem, Nottingham Castle and the city's famous life-size bronze statue of Robin Hood. Notable hotels located along Maid Marian Way include the Express by Holiday Inn, Park Plaza and the Travelodge Nottingham Central Hotel. Other accommodation close to central Nottingham includes the Brittania Hotel and the Rutland Square Hotel, both of which are located along St. James Street. The Colwick Park, George Street, Talbot Street, Wollaton Street and Waterfront Plaza also contain more than their fare share of hotels.